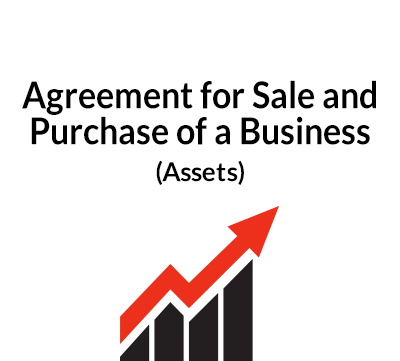 This agreement is designed for use where two parties are involved in the purchase/sale of assets of a business. taxes/fees, other expenses and prorations, etc. a miscellaneous clause detailing survival of representations and warranties, covenant of further assurances, force majeure, notices, governing language, headings, assignment, severability, counterparts and knowledge of the parties. This form is comprehensive in scope and is of moderate complexity, and can be adapted for use both with smaller, less complex transactions and larger, more complex transactions. It includes language relating to the transfer of real estate, which can be deleted if not needed. It is intended for use in any state in the United States. 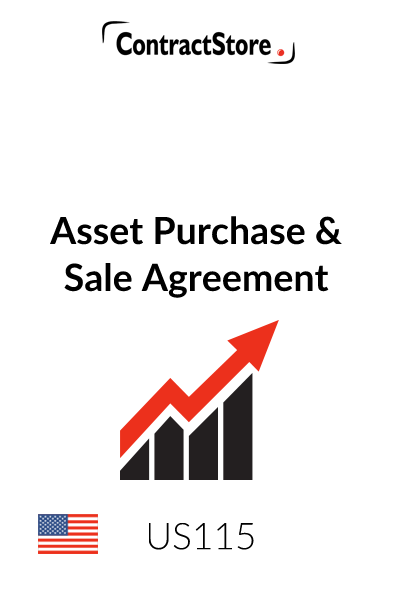 This form of Asset Purchase and Sale Agreement is designed for use in the context of a sale and purchase of substantially all of the assets of a business. It is written for use in the United States or where US law governs the transaction. The parties are referred to as “Buyer” and “Seller”. The form is relatively even-handed, if somewhat favorable to the Seller, but should be viewed as a good starting point for negotiation by the parties. • It covers substantially all of the assets of a defined “Business”, but it can easily be modified to cover a limited subset of those assets. • It contains provisions relating to the purchase and sale of real estate, but these provisions can be deleted if not required. • Other categories of assets are similarly defined separately and can therefore be deleted or modified as required. It also contains numerous provisions intended to promote the objective of maintaining business continuity during what might otherwise be a transaction that may be disruptive to business-as-usual. The form anticipates that the parties will sign the Agreement and close the transaction after a short delay, ranging from as little as a day to weeks or even months. This period is customarily used for due diligence and/or to arrange financing. This form is intended for use within the United States. However, as is the case with any agreement for use in the United States, regard must be had for the possibility of variations in the laws from state to state. In the context of real estate, the laws do tend to be substantially similar among the states, but there are areas of substantive difference. In this regard, the state of Louisiana stands out in particular, as it bases parts of its property, commercial and other laws on the civil codes rather than on the common law. This form provides a good starting point for preparing a first draft of an Asset Purchase and Sale Agreement. However, as with use of any form, it is very important to take the time to read the form in its entirety to ensure that it is customized appropriately for use in your individual situation. For all but the simplest of transactions, it can be anticipated that some customization will be in order; and as mentioned above, it may also be advisable to consult with competent legal counsel and/or tax advisors. The parties’ names and states of incorporation should be inserted at the beginning of the document. This form presumes that the Agreement will be signed on behalf of corporate parties, but if some other type of entity is used (or if either or both parties is an individual), then the language should be modified accordingly. The recitals define the term “Business” by reference to business activity and to location. The signature blocks should be customized as required. If either or both parties is an individual, then the language should be modified accordingly. The italicized language in brackets is for guidance only and should be deleted. Note that forms of Exhibits H, I and J can be found on the ContractStore website. Paragraph 1.1 defines the term “Assets” and provides, at a very basic level, for the conveyance of the Assets from the Seller to the Buyer. Paragraph 1.2 allows the parties to exclude certain assets from the scope of the conveyance, by defining the term “Excluded Assets”. The approach, therefore, is to define assets by exclusion (i.e., the Buyer gets everything other than what is expressly excluded). This is an extremely flexible approach, allowing the parties to move assets by simply deleting the relevant numbered sections or by moving them between paragraph 1.1 and 1.2. It also provides the Buyer with some assurance that it is acquiring all of the Assets necessary to carry on the Business as then conducted. The blank spaces in paragraph 1.1.1 should be completed with the location of the real estate (if there is any). Paragraph 2.1 defines the purchase price as the sum of a defined base price (blank space to be completed by the parties), the value of inventory and the value of certain other assets. Paragraphs 2.2 and 2.3 provide for final calculation and payment of the purchase price. Paragraph 2.4 allows the Buyer to resell certain uncollected accounts to the Seller. The allocation of the purchase price provided for in paragraph 2.5 is desirable from a tax reporting standpoint. Paragraph 3 limits the liabilities to be assumed by the Buyer to those that are listed therein. Other assumed liabilities should be added to this list as agreed by the parties. Paragraph 4 contains an overview of the closing of the transaction – date, location and closing deliveries. Paragraphs 5.1 to 5.3 deal with issues relating to employees, employment transition and employee benefits. The basic thrust of these provisions is for the Seller to retain and/or cover any liabilities relating to these matters and to give the Buyer as much flexibility as possible in hiring and retaining employees of the Business. Paragraph 6 gives the Buyer the option of whether to proceed with a closing if the assets are lost, destroyed or condemned (i.e., confiscated by the government in a “taking”). There is also provision for an adjustment to the purchase price or the assignment of any insurance proceeds. 7. TAXES/FEES, OTHER EXPENSES AND PRORATIONS, ETC. Paragraphs 7.1 to 7.3 provide for the allocation/proration between the parties of taxes, fees, transaction expenses and other similar items. The provisions follow customary practice, though can be altered if the parties so desire. 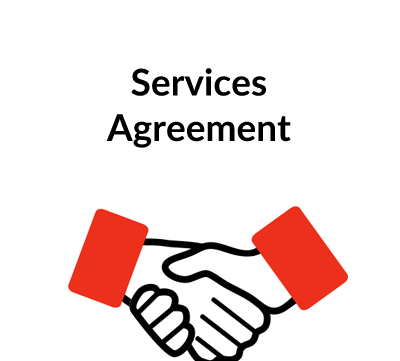 Paragraph 8.1 provides for other agreements that the parties intend to enter into in connection with the purchase and sale. Specifically, noncompete, consulting and nondisclosure agreements are listed. (Forms of each of these may be found elsewhere on the ContractStore website.) Other ancillary agreements may be provided for as required. Paragraph 8.2 requires the Buyer to provide “tail” product liability insurance coverage for the Seller for a period after the closing of the transaction. The dollar limits in brackets should be adjusted as appropriate for the nature of the liability in question. Paragraph 9 contains provisions relating to real estate. Paragraph 9.1.1 provides for commitments for title insurance to be supplied by the Seller. If the Buyer elects to purchase title insurance, it will be at the Buyer’s cost. Paragraphs 9.1.2 to 9.1.4 provide for a survey and for the parties to resolve any issues relating to title to real estate before the closing. Paragraph 9.2 is aimed at ascertaining the environmental condition of the real estate, and allowing the parties to resolve issues relating thereto before the closing. • Corporate organization, qualification to do business, corporate power, conflicting agreements/governmental consents and corporate authority of the Seller. • Pending actions, claims and litigation. • Employees, employee benefit plans and labor matters. • Title to real and personal property. • Condition of the Assets. • Purchase orders and contracts. • Financial condition of the Business. • Taxes and insurance relating to the Business. • Composition of Assets (i.e., that they are sufficient to conduct the Business). • No brokers involved in the transaction. Paragraph 10 provides for exceptions to these representations and warranties to be communicated by the Seller to the Buyer by way of a disclosure schedule appended to the Agreement. The parties should review paragraph 10 in conjunction with the disclosure schedule provided by the Buyer to ensure that they are both comfortable with the representations, warranties and disclosures. Paragraph 11 does not provide for a disclosure schedule as the scope of the Buyer’s representations and warranties is so limited that a disclosure schedule is unnecessary. Paragraph 12 describes the conditions to the obligation of the Buyer to close the transaction. These are customary for a transaction of this type. 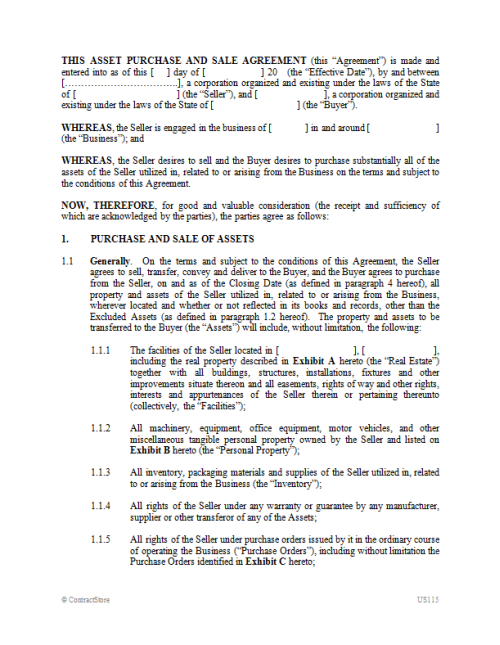 Note that paragraph 12.15 provides for the delivery of conveyance documents and other closing deliveries, and in that regard, a form of a Bill of Sale may be found elsewhere on the ContractStore website. Paragraph 12.15 does not provide for delivery by the Seller of a legal opinion, but that is certainly something that the Buyer may wish to explore. Paragraph 13 describes the conditions to the obligation of the Seller to close the transaction. Paragraph 13.8 provides for the delivery of the purchase price and other closing deliveries at closing. Paragraph 14 contains 14 separate pre-closing covenants, intended to ensure that the Business is operated in the ordinary course and consistent with prior practice in the period between signature of the Agreement and the closing. Paragraph 15 provides for post-closing indemnification of the Buyer by the Seller in connection with pre-closing liabilities and obligations and breaches by the Seller of the Agreement. As such clauses go, it is relatively expansive in scope. Note that paragraph 15.3 provides for termination of most of the indemnification obligation two years after closing. Paragraph 15.4 contains further limitations in the form of a “basket” (a de minimis lower dollar limit, below which indemnification will not apply) and a “cap” (an upper dollar limit on the indemnification obligation). The basket and cap amounts should be agreed on by the parties and inserted in paragraphs 15.4.1 and 15.4.2. Paragraphs 15.5 and 15.6 contain further safeguards to prevent the Buyer from taking unfair advantage of the indemnification provision and unduly burdening the Seller in this regards. If the Seller is a closely-held corporation (i.e., private company with a limited number of shareholders), the Buyer may wish to consider backing up the Seller’s indemnification with guarantees or joinder agreements from the shareholders, especially if the Seller does not anticipate having significant continuing operations. Another option is to require the Seller to hold a portion of the purchase price in escrow for a period of time, in order to ensure that funds are available after closing to satisfy any indemnification claims. Paragraph 16 contains the corresponding provision for indemnification of the Seller by the Buyer, in connection with post-closing liabilities and obligations and breaches by the Buyer of the Agreement. Note that paragraph 16.3 contains a basket but not a cap. Paragraph 17 allows for termination of the Agreement between the time that it is signed by the parties and the date of finalization. The grounds for termination are limited to mutual agreement of the parties, breach of agreement by the non-terminating party, due diligence that is unsatisfactory to the Buyer, a delay in closing beyond a specified date or action by the government to enjoin the transaction. Choice of law can be contentious in U.S. contract negotiations because there are 50 states to choose from, and each party may have an instinctive bias in favor of using its own state law. Unless there is some reason to pick another state’s law (e.g., more favorable substantive law), it is customary to pick the laws of the state with which the drafting party is most familiar (again, usually its own state). This choice of law provision picks the laws of a single state (federal laws apply regardless of the state law election), which is most likely to be respected by the courts if it has some relationship to the contract (subject to application of mandatory principles of local public policy). The dispute resolution provision offers alternative language for arbitration and litigation. The clauses do leave blank a number of matters, including the place of arbitration and the choice of state for litigation-based dispute resolution. The choice of rules is also bracketed in case the parties elect to use a different set of rules. In U.S. litigation, the prevailing rule is that each party bears its own litigation costs (subject to some narrow statutory and other exceptions). The language in paragraph 18.3 is intended to impose the so-called “English rule” to litigation costs. Most states used to have in force bulk sales statutes that would provide protection to creditors in the context of the transfer of all of the transferor’s assets outside the ordinary course of business. These could potentially result in liability on the part of the transferee. Many of these statutes have been repealed. Paragraph 18.4 contains alternate language relating to bulk transfer laws depending on whether local state law contains a bulk transfer statute. • Paragraph 19.1 provides for survival of the representations and warranties beyond the closing date. • Notice information should be completed in paragraph 19.4. Notice by e-mail could also be added as an option if the parties are comfortable with this method of notice. • The non-assignment provision in paragraph 19.7 contains a couple of options between which the parties should choose. The brackets and bracketed language that is redundant should be deleted. Note that the Buyer may wish to preserve its right to assign its rights under the Agreement to a new entity set up to acquire the Business, and if so, the language should be modified accordingly. • Paragraph 19.8 should not be deleted. Most states have moved away from an “all-or-nothing” approach to enforcing illegal or unenforceable contract provisions, and the severability provision in paragraph 19.8 is an attempt to instruct a court to take a flexible approach to the Agreement in the event that one or more clauses prove to be illegal or otherwise enforceable, provided that it is still possible for the essential intent of the parties to be achieved. • Paragraph 19.10 defines the parameters within which to interpret a knowledge qualifier in a representation/warranty. Paragraph 20 is commonly referred to as a “merger” clause, and is intended to avoid pre-contract discussions from surviving into the written contract. It also stipulates that amendment and waivers of the Agreement must be in writing in order to be effective. I found the whole process extremely easy to use and the service I received for tailoring the contract to my specific needs was first class. What a fantastic service!